Condition where tissue die and decay as a result of bacterial action. Dry gangrene in old people. Often indicated in gangrene of the lungs. Foetid diarrhea with great prostration. Violent burning, not relieved by Ars. Alb though indicated. Ars. sometimes fails then we have to resort to Anthracinum. Anthra. has precisely the same symptoms as Ars. but to a more intense degree. 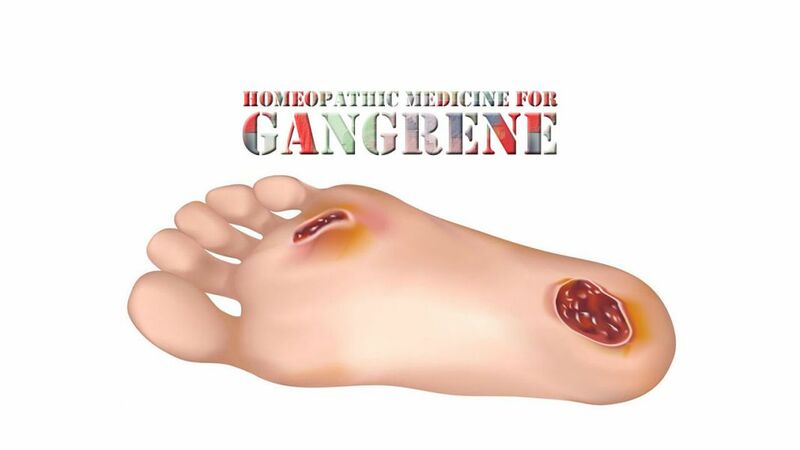 It is useful in dry gangrene of old people. Dry gangrene of the extremities. Burning, as if sparks of fire were on the parts affected. Burning is worse from external heat and relief from cold application (opp. Ars., Anthra.) inspite of coldness of the part. Wants part uncovered, though the part is cold on touch. Limbs become pale, cold and shriveled or cold and lead colored, losing all sensibility. Carbuncles and boils, becoming gangrenous. Humid gangrene in cachectic persons whose vital powers are exhausted. The parts affected have a purple look and are icy cold. The secretions are foul with great prostration. There is no restlessness as in Ars. Gangrenous blisters, bluish or black. Parts become blue and purple and then there is oozing of dark decomposed blood and pus. The limbs being covered with black blisters and much swollen, emitting a foul odor.